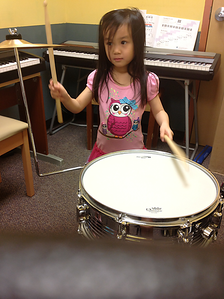 We are offering Music Summer Camp this summer at our Brambleton location. All camps will be held Monday through Friday from 9 am to 3 pm. Cost for each camp is $225.00 if you register by April 1st. After April 1st, it will be $250. For more information and registration, please contact yasasja@umich.edu, or call (703) 786-4110. Register by April 1st and save $25. Concepts covered: Hand position, finger numbers, quarter note, half note, dolled half note, whole note and quarter rest, musical alphabet, basic intervals, staff notation, clefs, time signature, tie, dynamics, parts of the piano, history of the piano, music history. 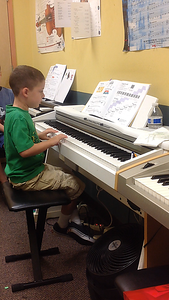 Objective: Beginning piano students will be introduced to the piano, and notation. Students will be able to read notation and play simple piece of music independently. Students will also be exposed to music history, and theory. Students with prior piano experience will be given more challenging repertoire and theory exercises. 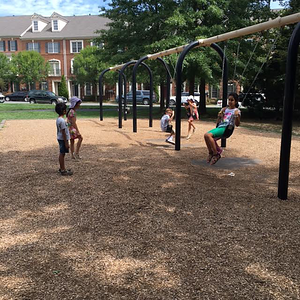 All students will be given the opportunity to participate in a small group ensemble during the summer camp. Students will be exposed to music from different periods, countries, genres, composers and artists. Concepts covered in Piano: Hand position, steady beat, eurhythmics, quarter note, half note, whole note, and eighth notes, music alphabet, intervals, staff notation, time signature, tie, staccato vs. legato, dynamics, and music history. Concepts covered in Guitar: Acoustic/Classical/Electric guitars, tuning, playing position, six strings and notes, different parts of the guitar and their functions, C chord, G7chord, G chord and D7 chords. Objective: Students will be exposed to both piano and guitar equally. 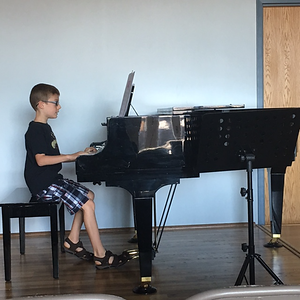 They will be able to play at least one piano piece and one guitar piece of their choice by the conclusion of the summer camp. Students will also be exposed to a decent amount of music theory and music history where they will learn about different genres, and musical periods. Concepts Covered: Beginners will be taught- hand position, finger numbers, quarter note, half note, dolled half note, whole note, quarter rest, musical alphabet, basic intervals, staff notation, clefs, time signature, tie, dynamics, music history. Intermediate to advanced students will be taught ledger lines, harmonizing, sharps, flats, I and V7 chords, sight reading, C Major scale, G Major scale, F Major scale, eighth notes, transposition, phrasing, tempo markings, pedaling, form (binary, ternary), compound time, ostinato, alberti bass, root position triads, 1st inversion triads, 2nd inversion triads, composition, and 16th notes. 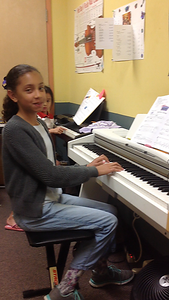 Objective: Beginning piano students will be introduced to the piano, and notation. Students will be able to read notation and play simple piece of music independently. Students will also be exposed to music history, and theory. Students with prior piano experience will be given more challenging repertoire and theory exercises. 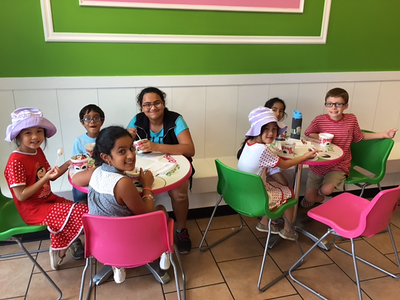 All students will be given the opportunity to participate in a small group ensemble during the summer camp. Students will be exposed to music from different periods, countries, genres, composers and artists. Students will be taught the basics on each and every orchestra instrument. Student will be given to opportunity to choose their favorite/appropriate band instrument and will be given the opportunity to study a piece of repertoire of their choice. Concepts covered in Piano: Hand position, steady beat, eurhythmics, quarter note, half note, whole note, eighth notes, music alphabet, intervals, staff notation, time signature, tie, staccato vs. legato, dynamics, music history. Concepts covered in Voice: Posture, breathing, head voice, chest voice, tone quality, agility, range, different voice types/categories, different styles of singing, diction, pitch, rhythm, presentation, phrasing, sight sighing/solfedge, signing with and without an accompaniment. 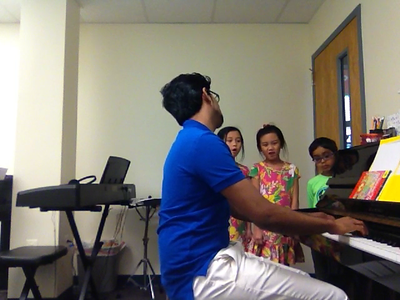 Objective: Students will be exposed to both piano and voice equally. 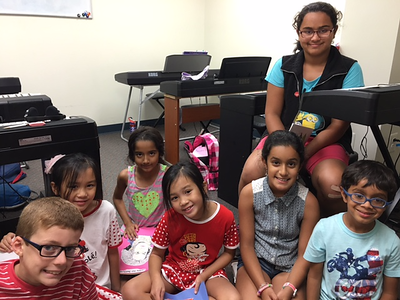 They will be able to play at least one piano piece and sing at least one appropriate song of their choice at the conclusion of the summer camp. Students will also be exposed to a decent amount of music theory and music history where they will learn about different genre’s musical periods.